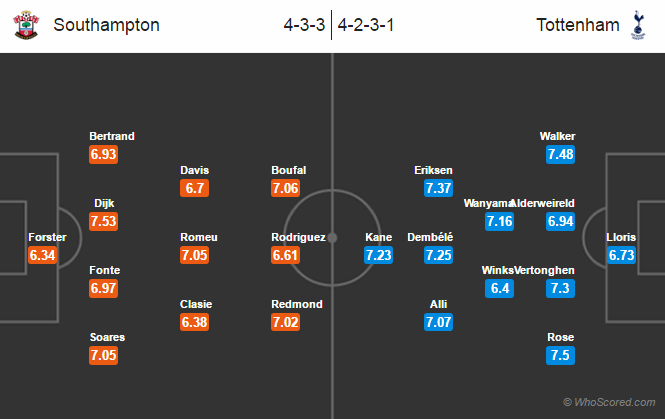 Premier League match preview -Possible Lineups, Team News, Stats – Southampton vs Tottenham. game week 18. Referee: Mike Dean, Stream Guide: Watch Live. Southampton are without Jake Hesketh, Charlie Austin, Matt Targett and Jeremy Pied through injury. Florin Gardos has returned but is not match fit. While Alex McCarthy remains a doubt. Jose Fonte and Steven Davis both are likely to return to the starting lineup. Erik Lamela is doubtful with a hip injury while Toby Alderweireld, Danny Rose and Vincent Janssen are all doubtful for this game. Duo defenders Alderweireld and Rose are likely to return. Mauricio Pochettino is expected to start with a similar lineup as of last game. Eric Dier and Moussa Sissoko both are eyeing for a starting node. Southampton have lost only one of their last six Premier League games. Spurs have won three of their last four Premier League games. Spurs have won four of their last six league games against Southampton. Southampton have lost only one of their last 13 home league games. Spurs have not won any of their last five away league games. The Saints have kept clean sheets in their last three home league games. Southampton 1 – 1 Tottenham, tough and good game. Spurs are likely to break the deadlock but the home side will be able to make a comeback to get a point at home.